Graphene is said to be a highly promising new material. However, the methodical insertion of chemically bound molecules and atoms to manipulate its properties remains a big challenge. Recently, researchers of the Friedrich-Alexander-Universität Erlangen-Nürnberg, the University of Vienna, the Freie Universität Berlin and the University Yachay Tech in Ecuador have succeeded in precisely validating the spectral fingerprint of such compounds in both theory and experiment for the first time. Their findings have been published in the scientific journal Nature Communications. 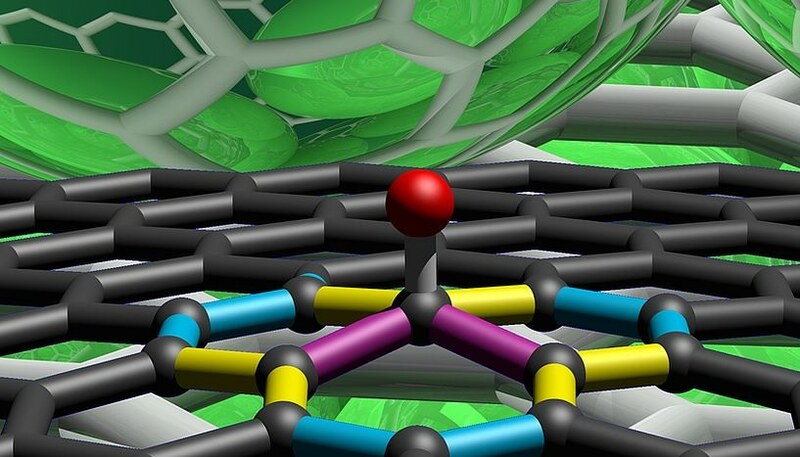 Section of a graphene network with chemically bound hydrogen atom: the spectral vibrational signature of the single carbon-carbon bonds adjacent to the bound hydrogen atom is highlighted in different colors (Copyright: Frank Hauke, FAU). Two-dimensional graphene has single layers of carbon atoms and displays fascinating properties. The transparent material conducts heat and electricity very well. It is at the same time solid and flexible. Furthermore, the electrical conductivity can be nonstop varied between a metal and a semiconductor by, e.g. inserting chemically bound molecules and atoms into the graphene structure, the so-called functional groups. These unique properties offer a broad range of future applications as e.g. for ultrafast components in the semiconductor industry or new developments in optoelectronics. However, a successful application of graphene in the semiconductor sector can only be realized if properties such as the size, the conductivity and the defects of the graphene structure induced by the functional groups can already be modulated during the synthesis of graphene. In an international teamwork of scientists led by Andreas Hirsch from the Friedrich-Alexander-Universität Erlangen-Nürnberg in close partnership with Thomas Pichler from the University of Vienna, accomplished a fundamental breakthrough using the latter’s newly created experimental set-up. They were able to identify vibrational spectra as the specific fingerprints of step-by-step chemically altered graphene by means of light scattering for the first time. This spectral signature, which was also theoretically attested, allows defining the type and the number of functional groups in a rapid and precise way. Among the reactions they studied, was the chemical binding of hydrogen to graphene. This was implemented by a controlled chemical reaction between water and specific compounds in which ions are introduced into graphite, a crystalline form of carbon. This enables the manufacture of custom-made graphene-based materials with controlled electronic transport properties and their application in semiconductor industry.